Canon RAW Codec is a software plug-in that, when installed in Windows, enables the import and display of RAW images with the file extension .CR2 that captured and taken with Canon cameras. With the Canon RAW codec, photographers or designers can easily open, view and manipulate Canon RAW images in Windows Vista. However, the codec does not support .CRW RAW image files, and can be used only on 32-bit version of Windows. It’s not compatible with the 64-bit Windows. The codec works on Windows 8, Windows 7 (including SP1), Windows Vista (including SP1/SP2) and Windows XP (including SP3). Go to Drivers & Software tab. Select an Operating System from the drop down list (without 64-bit). 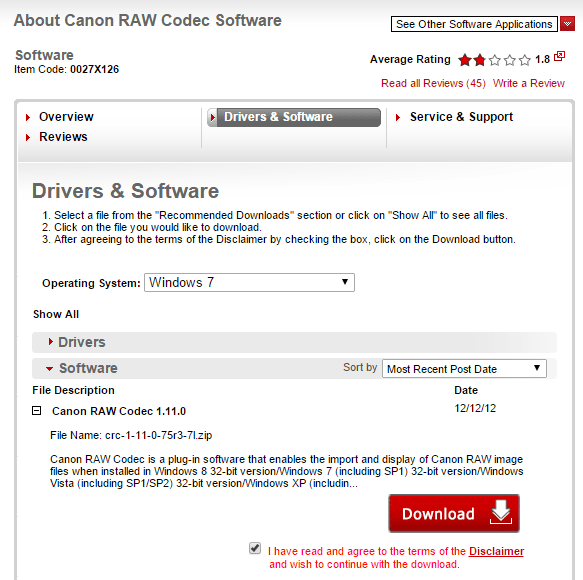 Expand Canon RAW Codec 1.11.0 or Canon RAW Codec 1.9.0. Tick the check box for “I have read and agree to the terms of the Disclaimer and wish to continue with the download”. Hit Download button to download and install the Canon RAW codec.